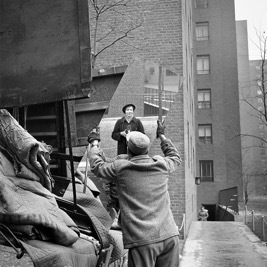 Much has been written in the past decade about Vivian Maier. Maier, who photographed extensively in medium format black and white during the 1950s and ‘60s, is street photography’s Cinderella Story. During her life, her photographs were mostly unseen and often undeveloped, and she left behind a dusty collection of photos and negatives in a storage unit full of boxes and suitcases. 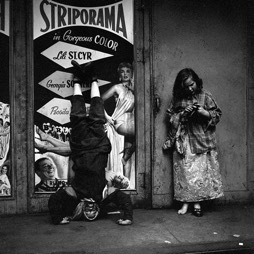 By the time her work resurfaced in the hands of a number of Chicago collectors in 2007, Maier was 81 years old, decades removed from the Vivian who explored the streets of America’s cities with a Rolleiflex camera. Maier made her living as a nanny in Chicago’s affluent North Shore. It was there, and also in the city center, and in Los Angeles and New York as well, that she shot over 150,000 images--photographs of people, architecture and often of herself. In 2007, two years before her death, Maier stopped making payments on a storage unit and its contents went to auction. At the time, John Maloof was working on a book about Portage Park, the neighborhood where the unit was located, and he purchased the majority of Maier’s work, over 30,000 negatives total. Through this series of events, Maier’s work took on a life of its own: Maloof, who was unable to find anything about the photographer whose life work he owned until a Google search led him to her obituary in October 2009, eventually posted her work to Flickr. There, it went viral, and caught the attention of art collectors and enthusiasts around the world. More than almost any other street photographer of the time, Vivian Maier’s body of work is vast, unbiased, and encyclopedic. Working outside of the pressures and mores of the art world while at the same time showing incredible technical and creative skills, Maier was free to create street photographs that touched on a number of complex themes, often with the children she nannied tagging along on walks through the city. “The most arresting subjects” in Maier’s work, according to a writer at The Independent, “are those people on the margins of successful, rich America… kids, black maids, bums flaked out on shop stoops.” Maier’s eye for street photography was empathetic, understanding--her work shows a photographer engaged with the world around her rather than analytic of it. Beyond the thematic and human elements, Maier’s work is also an exploration of forms and patterns, of shadows, of visual elements and their boundaries. The simplicity of a square aspect ratio and a black and white palette gave Maier infinite space to reduce busy city streets to a collection of shapes--street photographs that often hint at a second life, one of abstraction. Despite her undeniable skill and relentless output, Maier lived most of her life as a nanny. She was helped and supported by friends and by the grown children who she cared for in the ‘50s and ‘60s, but she died relatively poor and entirely unknown to the wider public. The virality of her work online brought the inspiring story of Chicago’s prolific nanny photographer to computer screens across the globe in a matter of months, and Maier became a posthumous art world darling. Gallerists pursued her work, which was written about and talked about extensively. Anyone who knew Maier closely in her working years was suddenly a person of interest. Two documentaries about her were released in 2013, featuring several interviews with people who Maier nannied. Maloof, who now owns around 90% of Maier’s work, and others have published several books of her work. And the fame, although Vivian never sought it out, is well deserved--her work stands out amongst that of the biggest names in street photography as something a little special.